poverty. Every day, there are underprivileged people among us who are helpless, living under the heavy chains of poverty. It is a shame that in this land of plenty, so many of these poor individuals move about their day under the blanket of debilitating lack of resources. When the NYPD Union president basically declares war on anyone who thinks that police brutality is a real issue, we must not allow his poverty to make us turn away. His uniform, badge, and tie must not hide his poor, downtrodden ability to apply complex thinking. This suffering, impoverished man has not been taught to see that in fact, it is possible to rage against police brutality and condemn the murder of police officers. Due to what may be intellectual malnutrition, this man's brain seems incapable of seeing beyond "either/or" thinking. This manifests itself in the belief that everyone is either a supporter of all police at all times or an enemy of all the police at all times. Jesus didn't put us here to allow this kind of poverty to go unattended. Let's ask ourselves, "What can I do to offer this underprivileged man a fair chance to become a well-adjusted member of society?" When the mayor of New York asks grieving, furious Americans to give up the right to protest, that mayor is clearly suffering from a heartbreaking lack of ability to bear witness to suffering and rage. As mayor of a city, Bill de Blasio's job is, among other things, to bear witness to the lived experiences of his people. This tone-deaf attempt to shut people up who are protesting their government's tendency to, of all things, shut them up with brutal and often deadly force, reveals a deep poverty in Mayor de Blasio that we should all dig deep to alleviate. Please consider giving what you can to poor Mayor de Blasio! When White men take to the streets of New York to declare to the world that they "can breathe," thanks to the police, my heart goes out to these poor guys who have revealed their poverty of vision. They have been deprived and underserved, these underprivileged souls. Their training in blindness to privilege and oppression ensures can't see that their message ("Police ensure my safety as a White person!") perfectly reinforces the narrative of the protesters that they are trying to undermine ("Police ensure the safety of White people!"). Please consider giving what vision you can afford to these unfortunate, downtrodden, folks. This is America, folks! We can help the poor! When the governor of Massachusetts admonishes protesters for being "disruptive," I close my eyes and shed a tear for this impoverished, suffering soul who could be successful member of society if we could only help him to see his potential! Tragically, this man carries the weight of an impoverished sense of history. Let us pray for this poor person who cannot imagine how disruption could possibly work towards justice. Deval, we won't give up on you. We believe in you and I hope readers will consider donating their basic understanding of history! Many White people have a deep, unnamed fear that the successful struggle for Black liberation will result in the "tables flipping," creating a country in which White people are treated as second-class citizens by a powerful Black majority. We should all commit to digging deep and giving all we can to alleviate the grinding poverty of experience that lies underneath this fear. Most White people suffer from a lack of Black friends, with no resources to draw on when it comes to actually knowing what it's like to be Black in America beyond the idiocy of popular media. This poverty allows us to maintain a vision of Black America as a monolithic, single-minded entity bent on taking power back from Whites for the sole purpose of revenge. I am happy to report that J. Cole has already given White people the following charitable donation to minister to our poverty. Please, let's match his donation by educating ourselves and others as to the deep sense of love that is the bedrock of liberation struggle. Maybe we can even band together to create a National Association for the (Mental/Social/Spiritual/Creative/Empathetic) Advancement of White People which can help us organize to lift us out of the poverty so many of us live in. Let's listen, and be thankful for the spirit of giving to the poor during this holiday season. As I begin to understand the way I'm programmed, there come fleeting moments of being able to see that even the way I see my Whiteness...is through the lens of my Whiteness. I cannot see outside myself. Surrender. Within this surrender, I begin to see that everything I "know" about the way the world works has been "known" through a supremacist framework. Society chose nearly all of my identities as the "superior" ones. And it wasn't long before I saw that those labels of superiority were disconnected from my lived experience. I witnessed and participated in morally repulsive activities carried out by people who shared my supposedly "superior" identities. Few people were available to help me process this disconnect. What does that experience of deep dissonance do to a child's brain? My foundations couldn't support the weight society placed upon them, and I became a defensive, scared, fragile person. Because the world insisted and still insists that I am superior, while I know and have always known that I am not. An unstable foundation compromises the stability of the entire structure. Today, beginning to see what Whiteness has done to me, so many of the things I *thought* I knew and understood are now revealed as inverted reflections of a fun-house mirror. All the grooves of life I've inhabited and loved and hated and envied and missed and feared...were just my perceptions under the influence of the powerful narcotics of supremacist thought. To realize this is to see that the ultimate prize is within my grasp: a reset button. A chance to see everything for the first time again, to "not know" what the world is like. Up could be down. In could be out. I have the chance to throw open every door that has been sealed with bitterness and resignation. A return to a childhood in which everything is possible, fresh. When I say that I support and will fight for Black liberation for my own sake as a White person, I mean it. For 30 years, White supremacy smiled in my face while shackling me to impossible standards of superiority that I could never attain. Invisible shackles. Black Americans have known this about White Americans, they have been forced to know this about us, better than we White people ever could. My revelations are old news...just new to me. White, man, straight, bearer of any of America's other privileged identities...you want freedom from the isolation and spiritual death that you were born into? Black liberation is liberation for all. For 400 years now Black people in this country have fought to organize and be recognized as first-class citizens. At every turn, many politically-mainstream Whites have responded to such movements with furious denial of the existence of racial inequality. Yet open up any mainstream K-12 American history textbook, and all the major movements towards Black liberation are held up as courageous expressions of humanity which have advanced the American experiment. You think MLK was roundly celebrated and praised by White people when he was alive? 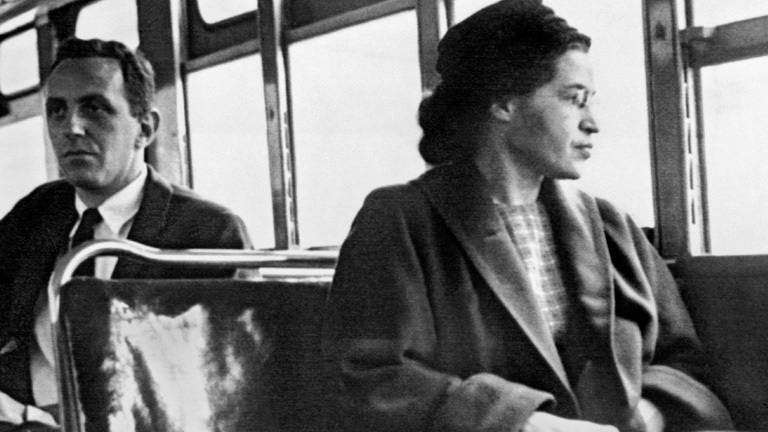 You think all the White peoples' lips trembled in admiration of Rosa Parks' courage while she was riding in the front of "their" bus? So if you're spending time fuming about those pesky ‪#‎blacklivesmatter‬ actions and how much overtime pay it's costing, please also spend some time planning what you'll say to your grandchildren when they ask you what you did during the civil rights movement back in the early 21st century. Is the One Ring at the center of J.R.R. Tolkien's "Lord of the Rings" trilogy is just a metaphor for Whiteness? *The One Ring was created by Sauron to concentrate and maintain his power over all of Middle Earth. The concepts of "White" and "Black" were created by the early American elite in order to maintain their power and wealth by discouraging poor African-Americans and European-Americans from uniting in opposition to the ruling class. *The power of the One Ring is, among other things, that it offers invisibility to the wearer. But this comes with a price: the Ring also slowly corrupts the bearer, leading the person to isolation and misery (as we see in the character of Gollum). The bearer slowly turns into a narcissistic, angry, loner, bent on accumulating power at the expense of their relationships. As bearers of Whiteness in America, we get to move through our lives without our race drawing attention to us. We are assumed to be "normal" Americans. Our actual diverse ethnic backgrounds (German, Irish, Italian, Polish, etc.) are largely unnoticed, while dark-skinned people are almost always seen as outsiders, exotic, dangerous, and "ethnic." Thus White people are able to move around much more easily in America. BUT...there is a price to the safety of Whiteness. To accept the comforting "normalcy" of Whiteness is to disconnect oneself from our humanity. The flip side of seeing Whiteness as "normal" is seeing Blackness as the "other," the undesired, the ugly, the dangerous. The safety of Whiteness requires the creation of Blackness as something to which we can be opposed. The result? White Americans are often socially isolated, even in our "own" communities. We're so used to separation that we forget how to be close, even with those we would call our racial kin. *People are drawn to the One Ring because it seems to offer limitless power to be wielded. But in fact, the Ring itself ends up wielding the bearer, using their physical incarnation to do its will. The seduction of Whiteness is powerful...it offers the bearer preferred treatment in almost every realm of American society--if we are seen as bearing Whiteness, we're more likely to be seen as smart, objective, wise, moral, innocent, pure, and deserving. But the price we pay for this preferred treatment is that we become foot soldiers in the war against Blackness; by cashing in on our Whiteness (even unintentionally), we ensure that Black people remain second-class citizens. Thus we become, as the bearers of Whiteness, instruments in the maintenance of power. *Part of Sauron himself is contained in the One Ring. When it is destroyed, Sauron is destroyed as well, and this is what frees all of Middle Earth from tyranny. White Americans have so bought into the made-up construct of Whiteness that we take it for granted. If we could expose the myth of Whiteness for what it is, it would shake our identities to the core, while offering us a chance for liberation along with all the people that Whiteness currently subjugates in the service of its maintenance.